The holiday season is here, which can means lots of travel in the coming weeks! Whether you’re the one heading out by plane, train, or automobile, or you’ve got folks coming your way, guest rooms ‘round the world are about to get a workout. If you happen to be one of the ones who is hosting friends or family, are you confident that your guest room is ready to receive them? Or are you slightly embarrassed at its current state and know there’s room for improvement? These spaces often fall to the bottom of the priority list in terms of furnishing and decorating, but it’s important to spend a little bit of time sprucing them up for your guests to help them feel welcome and at home. It doesn’t take much, I promise, and it will make a huge difference. Your visitors will thank you! Scroll on down to read my six practical “must haves” (and one bonus!) for every guest room - if you check the box on each of these, you’ll be in good shape. Today I’m focusing on guest room setup rather than the overall look. That could be another whole post in and of itself! So let’s get started. If you have a queen or full bed in your guest room and plan to have couples stay with you, it’s important to have a bedside table on each side with a lamp on top! You want to give your guests a spot for their phones, a glass of water, and maybe even some reading material right by the bed. Having a light within arm’s reach is helpful too. This past summer, we stayed in an Airbnb that had no table lamps and only one bedside table, and it was definitely not an ideal situation. We were always stumbling around around in the dark after turning off the overhead light or having to reach down to the floor to grab our phones or a book! Just like when you walk in your home through the front door and need a “drop zone” for your keys, the mail, etc., you want your guests to have access to a good “drop zone” in their room for their stuff. All you need is a clear surface - a natural fit for this is the top of a dresser, a small desk, or a console table. A mirror is a must-have for getting ready and having one in the guest room is definitely handy. If they have an ensuite (attached) bathroom, this may be less of a necessity, but if you can include one above a dresser or add a full length somewhere in the room (even if it hangs over a close door), your guests will appreciate that! We all travel with multiple electronics these days, and our phones, laptops, iPads need a spot to charge. Most people like to charge their phones by the bed, so if you can, try to make sure they can plug in their chargers by the nightstands. If the outlet happens to be behind the bed or isn’t readily accessible, try running an extension cord or power strip out to the bedside table. That small convenience goes a long way. Giving your guests access to your WiFi has become standard practice and I love the idea of posting it somewhere in the guest room so that they can hop on easily once they arrive and get settled. Doing it that way means you don’t have to worry about remembering the password either! Write it down or type it up, and throw it in a cute frame in a visible spot. We have ours posted in a frame on the top of the dresser and guests love it. This one may be optional depending on whether your guests have a private bathroom or not, but giving them a place to hang wet towels in their room is super handy. Sure, they can always hang them on a door knob or the corner of a door, but how nice is it to be able to put it on a designated hook instead? Add a hook or two to to the back of a door or hang a row of hooks on the wall if you have a good spot for that. They can double as hooks for coats as well! 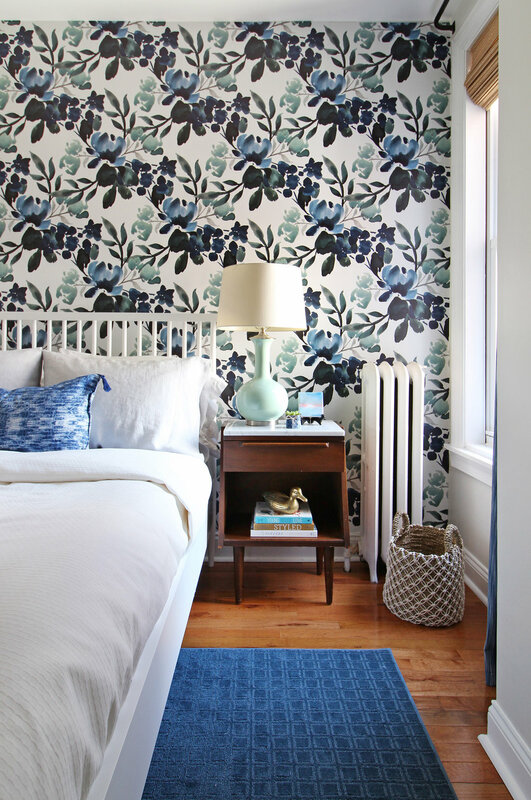 I love it when a guest room has a chair or another option for seating, but I realize that not every room has space for one (that’s why this one is a bonus tip!). If your visitors need a private space to read, work, or just hang out for a bit, it’s really nice to have a place to sit that’s not the bed. Try putting a small chair in a corner, adding a settee or bench at the end of the bed, or, if you happen to have a lot of extra room, creating a little seating area is lovely! So those are my guest room essentials! What would you add to the list? And P.S. this post piggybacks on another one I wrong a couple of years ago on helping your overnight guests feel at home - be sure to head there next!